BLACK OUT: Solvent that removes black scuff marks. ISO-PURE: Waterless hand sanitizer containing 70% denatured alcohol. Green apple scentand made with glycerin for soft hands. Not for consumption. 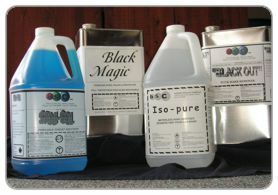 BLACK MAGIC: A stainless steel polish suitable also on other high gloss metals. May also be applied to vinyl baseboards and kickplates to increase gloss. SANI-SOL: An outdoor commercial toilet treatment. Highly scented and concentrated. This product is available in a variety of customer preferred scents.